When did you last go a day without sugar? It is public health enemy number one, so perhaps it has been some time since you last had a chocolatey treat, doughnut or a syrup dosed milky coffee. Maybe you’ve stopped buying white sugar, granulated or in powder. But before you get too smug, think again. Experts now warn that it is hidden sugars, often in our beloved supermarket ready meals and so-called low-fat snacks which are causing serious trouble. All the extra sugar in our diets have crept up on us, partly because we have become a nation of snackers. Nigerians consume more than twice as much sugar in one day compared to the global average. We are addicted to sugar and many of us do not realise because we don’t understand where sugar is hidden or how to avoid it. We have been wrongly encouraged to eat a low-fat diet to lose weight and control some health conditions such as diabetes. The result of our ignorance is everywhere. At least half of all adults are obese. You might think a vanilla latte and a blueberry muffin are a harmless enough breakfast but together they provide more than the daily recommended sugar for adults (around 30 grams). That is the equivalent of six teaspoonfuls a day. There are several different sugars, but the one you buy in the supermarket is known chemically as sucrose. Sucrose is a molecule created by two simpler sugars, fructose and glucose, joined together. Despite repeated expert warnings and health messages, there is still a lot of confusion over sugar. We don’t, for example, seem to respect that sugar in fruit (called fructose) or in carbohydrate foods (called glucose) can be just as dangerous to the body when consumed in excess. 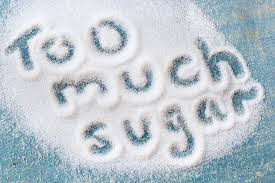 After all, white sugar (sucrose) is made up of fructose and glucose. Even natural sweeteners such as honey, agave nectar and maple syrup contain one or all of them. Although fruit juice and smoothies count towards one of your five-a-day, they too can have naturally occurring sugar levels approaching those of Coca Cola. May people are genuinely mystified as to where the sugar in their diet comes from as they believe they have already cut out all the sugar they can think of. From chocolate bars to sugar in their tea. Often thinking that “fruit is healthy”, they are eating loads of bananas, pounds of grapes, oranges, mangoes and wondering why they still gain weight. A variant of this is drinking too much fresh orange or fruit smoothies. Fruit provides important vitamins and minerals and fibre so it shouldn’t be avoided altogether. But choose less naturally sugary fruits like raspberries, blueberries, grapefruit or lemons, instead of mangoes, pineapples or grapes. Limit your portions to one or two a day (we should get most of our five a day nutrient from vegetables) and have whole fruit rather than juice or smoothies. The number 1 rule, is to avoid processed food and cook from scratch. Reducing starchy carbs such as white bread, cereals, white rice, white pasta is another important way to cut your sugar intake. So, swap your cereal or toast at breakfast for an omelette with mushrooms and cheese or porridge and choose whole grain or seeded loaves over white bread. These take longer to digest and cause a smaller peak in insulin levels. Irrespective of their source, the body processes sugar the same way for use as energy, but what it needs is a slow, steady supply rather than a series of deluges. Being too radical won’t work. While we can give up granular types of sugar, dieticians agree on eating a good variety of food in moderation rather than excluding whole food groups.